The combination of optical and genetic methods to control the activity of specific cell populations in various brain regions seems to be a promising approach to modify more localized neurological disorders and symptoms, e.g. drug-refractory focal epilepsies or motor dysfunction in Parkinson’s disease. Opsin genes, that encode light-activated ion channels and pumps, can be genetically targeted to defined neuronal populations using locally injected viral vectors (rAAV, recombinant adeno-associated virus). The translation of optogenetic strategies from animal studies to clinical trials including diseases that affect larger brain regions, e.g. neurodegenerative disorders as lysosomal storage and motor neuron diseases, will, however, substantially depend on the systemic delivery of such viral vectors to transduce cell populations in more widespread brain and spinal cord areas. The systemic delivery of viral vectors depends on a restricted blood-brain barrier (BBB) maturation, and on the existence of specific transport mechanisms, requiring so far neonatal animals and BBB integrity to transduce the targeted cell populations. As, however, neurodegenerative diseases affect patients at more advanced ages, at which the BBB is already maturated and has lost some of its integrity, systemic viral vector delivery may become much more challenging in (older) adults. We thus aim to investigate the impact of aging and BBB breakdown on the efficacy of systemic viral delivery using spontaneously hypertensive stroke prone rats (SHRSP), an animal model of cerebral small vessel disease characterized by age-dependent widespread BBB integrity loss. In SHRSP, we will further examine age-dependent effects of the body-wide transduction of viral vectors, and the development of rAAV antibodies, following the intravenous administration of those gene transfer vehicles. 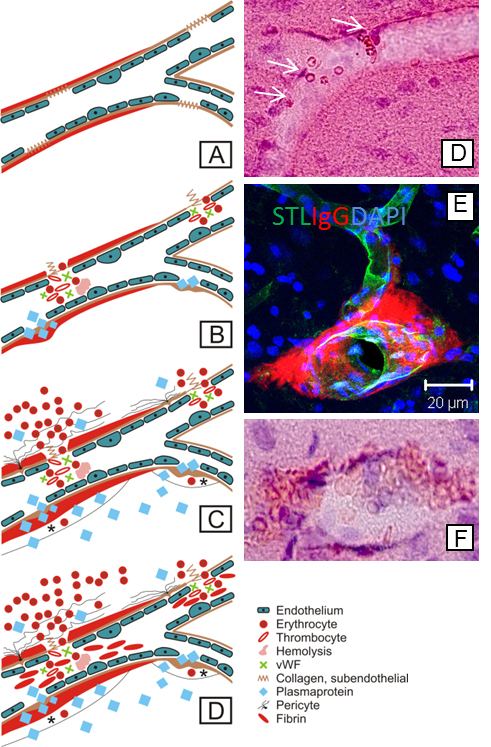 Blood-brain barrier integrity loss in SHRSP is indicated by several pathologic changes developing in a temporal manner: endothelial damage (A) results first in wall-adherent erythrocyte accumulations (B, white arrows in D) and plasma protein leakage (B & E), in subsequent small perivascular bleeds (C & F), and, finally, in small vessel occlusions (D). STL, solanum tuberosum lectin (endothelial marker); IgG, immunoglobulin G (plasma protein); DAPI, 4′.6-Diamidin-2-phenylindol (nuclear staining); vWF, Von Willebrand factor. Taken from Schreiber et al., J Alzheimers Dis. 2014;42 Suppl 3:S205-15.